What additional features are needed in the fridge? Home / Housework / What additional features are needed in the fridge? 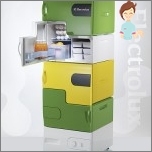 In this article we will try toCheck all possible functions, which can be equipped with a refrigerator last generation. This knowledge will help determine the choice of the refrigerator that best meet your needs. freshness zone in the refrigerator if the zero zone -nuzhna? Zero Zone - a chamber in which the temperature is close to 0, which provides better preservation of products. Where is it located? 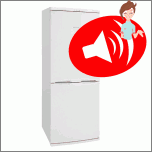 The refrigerator is usually placed at the bottom of the refrigerator compartment. What is it useful? This camera allows you to store seafood, cheese, fruit, vegetables, fruits and herbs. When buying fish or meat, will keep these foods fresh, for further processing without freezing them. Wet area keeps the temperature from 0 to +1 ° C at a humidity of 90 - 95% and allows you to store products such as herbs to three weeks, strawberries, cherries fungi up to 7 days, 10 days, tomatoes, apples, carrots three months. Dry area of ​​of -1 ° C to 0, with humidity up to 50% and allows the cheese to save up to 4 weeks, the ham up to 15 days, meat, fish and seafood. This thing is great !!! Personally for me is much more useful than no frost. Without no frost had 1 time in 6 months to defrost the freezer, and the zero area use every day. Storage period in it a lot more that's for sure. I have a two-chamber Liebherr, and I builtThis zone prevents, as it takes a lot of space, biofresh area, the area can be compared with the two full drawers in the freezer. For me it is a disadvantage. It seems to me, if the family consumes a lot of sausages, cheeses, fruits and vegetables, this feature is very useful, but for me personally, there is no place to put the usual pots. 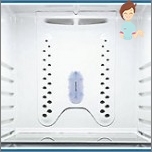 (((As for storage, the humidity there is really different from the vegetable compartment. We Liebherr. freshness zone just super! Now the meat is not spoiled for a long time, but the volume of the refrigerator there is less ... I do not bother, because food cook every day a new one. I Gorenie with «no frost», freshness zone -beautiful thing, temperature - 0, but if you put in the refrigerator temperature is uncertain, at the rear of the zero zone is formed condensate in the form of frost, and in this area the freshness of the temperature shift of 0. Also, it is not recommended to store cucumbers and watermelon, but is suitable for sausage and cheese, cottage cheese, fresh meat, if you bought today, and will be ready tomorrow -poslezavtra not to freeze. Superzamorozka -Why need in the refrigerator? Typically, the temperature in the freezer - 18 ° C,so when downloading new products in the freezer, so that they did not give up its heat they need to quickly freeze for a few hours this is necessary to press a special button to lower the temperature from 24 to 28 ° C, so far as the compressor. If the refrigerator has an automatic power off function, as the products will freeze, you must turn off this feature manually. disadvantages: The load on the compressor, it is recommended to use this function in case you want to download a large number of products. For example, because of one of the legs should not do. Some refrigerators are used trays with cold accumulators, which help to freeze faster and better to save the crushed products, they are installed in a freezer in the upper zone. Supercooling: For the safety of their fresh products needrapidly cooled, for this purpose there is a function of supercooling, which lowers the temperature in the refrigerator to + 2 ° C, evenly distributed over all the shelves. Once the products are cooled down, you can switch to the normal cooling mode. I very often use superzamorozki modewhen I load a lot of products which require fast freezing. It svezhecleplennye dumplings they need to quickly freeze until they are stuck together. I do not like the fact that this regime can not disable itself. He turned off automatic after 24 hours. The compressor has a very high freezing capacity, and operates quietly. We chose when superzamorozkoy fridge,selected without automatic shut-off, so I turn on the instructions in advance for 2 hours before loading, then a couple of hours to freeze, turn off. System No Frost-necessity or whim? automatic defrost and air coolerevery 16 hours of frost on the evaporator defrosted heating element. The resulting water enters the compressor capacity, and since the compressor has a high temperature, it is evaporated therefrom. That is why this system does not require defrosting. BenefitsNot require defrosting, evenly distributes the temperature at all locations, the accuracy of temperature regulation to 1 ° C, rapid cooling of the products, thereby providing a better preservation. 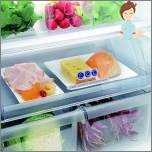 disadvantages: This refrigerated foods need to be stored in a closed form, so that they are not dried up. I have a refrigerator with a «no frost» system for 6 years and works great. Never complain, you do not want to defrost "the old" constantly. Cohnut nothing! Cheese, sausage - pack. Yogurt, cottage cheese, sour cream, milk, and certainly not dry. Mayonnaise and butter as well. Fruits and vegetables on the bottom shelf, too, is normal. Nothing like this had not noticed ... In the freezer meat and fish laid out on separate bags. I remember that's how old refrigerators - already shudder! This fear, constantly had to defrost! Feature «no frost» - super. This system drain excess water from the refrigerator. On the outer wall of the cooling chamber is an evaporator, which is located at the bottom of the sink. Since the temperature in the refrigerating chamber above zero, when the compressor is formed at the rear of frost. After some time, when the compressor stops, the frost melts, while trickling down the drain, and from there into a container located on the compressor, and then evaporated. Advantage: In the refrigerator compartment the ice freezes. shortcoming: Ice may form in the freezer. That would require a refrigerator defrosting manually. Every six months, unplug the refrigerator, I wash it, there is no ice, I like it. My parents drop Indesit, double chamber. I drip system do not like, they have a fridge for some reason constantly leaking all the time in the pallets and on the rear wall of the water is going. Well, it must be thawed, though rarely. Uncomfortable. What need shelves in the refrigerator? shelves with antibacterial coating - itlatest achievements of nanotechnology development, the thickness of the silver spray 60 - 100 microns, silver ions have effects on harmful bacteria, preventing them from multiplying. Shelves should have the function of regulation Glass Line height shelves. For the convenience of frozen dumplings, berries, fruits, mushrooms and fine food provided plastic pallets and various trays. bracket for bottles allow you to convenientlypositioned bottle, it can stir a separate cooler, as well as on the doors of a special plastic device, which fixes the bottle. Child Lock allows you to lock the doors and an electronic control panel. ice. In some refrigerators to save space the existence of such a shelf is not provided. Ledoformy simply placed in the freezer at allFood that is not very convenient, because the water might spill or clean water can get food, so in this case it is better to use bags of ice. For those who use food ice frequently and in large batches, manufacturers have provided ice maker - To receive the device is connected to the icecold water. An ice maker automatically preparing ice as cubes or crushed in form. For ice, just press the button a glass door located outside the freezer. Plastic containers that are embedded inthe internal panel of the refrigerating chamber door allow to obtain chilled water by pressing the lever, and the valve opens and a glass filled with a cold drink. This same system can be connected to the function of "pure water" connecting to the water supply through a fine filter to give cool water for drinking and cooking. In some models, it provides a container with ascorbic acid. Principle of operation: through the filter, accumulating moisture, while vitamin "C" evaporative cooling chamber diverges. It allows you to save energy, long-term absence of the house. This feature introduces a refrigerator in "sleep mode" prevents the formation of unpleasant odors and mold. If the refrigerator is small enough one compressor. Two compressors - are the two refrigeration systems that are independent of each other. One provides refrigeration operation and another operation provides freezer. 2 is good in the compressor when the candefrost the freezer without switching off the second. It's good? But if it happens that breaks one of the compressors will need to change the two. So for this reason I 1 compressor. We have a refrigerator with two compressors, super,gives cold in full, the temperature is regulated in different cells. In summer, the heat is very great helps. And in the winter, too, the pluses. The refrigerator compartment temperature do more, so as not to water was not too cold, and you can immediately drink. Advantages: High service life, as each compressor is switched on only when necessary for your camera. Performance is much higher cold. Convenient operation, as you can individually adjust the temperature in the chambers. When a power failure during the time from 0 to 30 hours refrigerator temperature from - 18 to + 8 ° C. What ensures the safety of products, to fix the problem. This special coating made of stainless steel, which protects the surface from dirt and fingerprints on the fingers of various contaminants. Deodorizer. Modern refrigerators are available with built-in deodorizer distributing deodorizing substances in specific locations destroying odors. Review: previously had put the soda in the fridge or activated carbon, with refrigerator antibacterial function the need has disappeared. The electronic control panel Built on the door, and shows the temperatureIt allows you to set the exact temperature, namely that you want to keep in the refrigerator and freezer. It may also have the function of storing electronic calendar, which records the time and place of all products Bookmark and prevents the occurrence of expiry. Display: LCD screen, built on the refrigerator door, which displays all necessary information, all important dates, information on the temperature of the products inside the refrigerator. MicrocomputerConnected to the Internet, which not onlymonitors the contents of the refrigerator, but also allows you to take orders for products by an email, you can get tips on food storage. Recipes cooking of the products that you order. During cooking, you can communicate interactively and receive a variety of information that interests you. We have listed all of the functions possessed bymodern refrigerator, and what additional features will be equipped with your refrigerator, it's up to you. It depends on what resources you have, and what features do you consider mandatory in your fridge. For us it is very important to know your opinion! Share it with us!